stash project, originally uploaded by All Things Mimi. So I decided to knit my friend Cheri a baby blanket. I fiddled around, looking for just the right yarn in just the right color, but couldn't find anything that really spoke to me. After mulling it over a while, I started looking through my yarn stash. 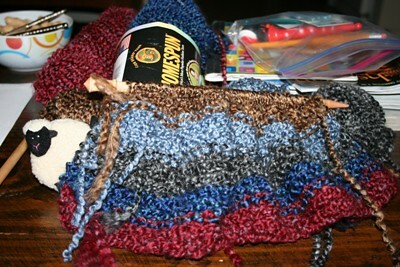 I have knitted several scarves out of Lion Brand's Homespun yarn. I like it because it is bulky, soft and machine wash/dry. I had odds and ends from 5 different colors just laying there, staring at me. Suddenly I realized all 5 colors kinda sorta went together. I decided to try knitting a striped blanket, then knitting a hat from whatever color I had the most of left after finishing the blanket. I really like the result, although darning in all the yarn ends was a bit of a job.